Ford Motor Co. looks to be testing a diesel version of its new Ranger midsize pickup truck. Spy photographers captured images of the automaker testing a modified Ranger on public roads near Ford headquarters in Dearborn, Mich. The truck is equipped with strange equipment in the bed and under the body that suggest the vehicle is diesel-powered. If Ford decides to offer a diesel engine in the Ranger it will join the Chevrolet Colorado and GMC Canyon as diesel-powered trucks in the midsize pickup segment. The Jeep Gladiator will make its own diesel engine available in 2020. 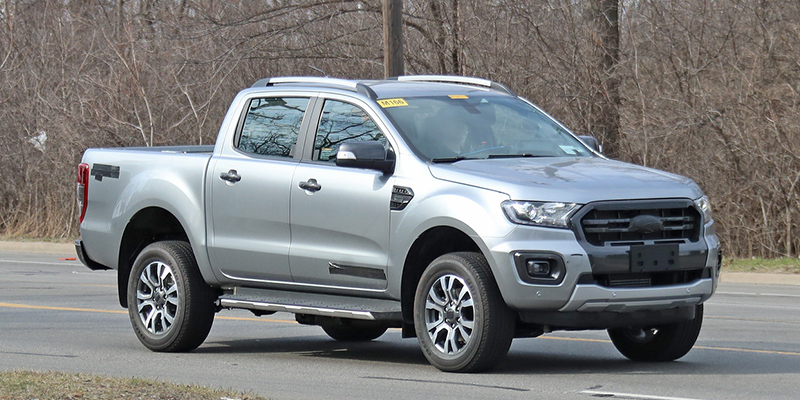 The truck spotted by photographers in Dearborn is a version of the Ranger sold globally, without the standard steel bumpers on U.S. models. Ford stopped selling the Ranger in the U.S. in 2011 but reintroduced the pickup to the market this year, selling more than 9,000 in the first quarter. That quickly gave Ford 7 percent of the midsize pickup market. A 2.0-liter turbodiesel engine is available in some overseas markets, and Ford could be testing it for arrival in America. Those models make 158 horsepower and 284 pound-feet of torque. The items that stand out under the body of the truck look to be special emissions equipment used to reduce nitrogen oxide pollution from diesel vehicles. The truck would need modifications to undergo diesel engine testing. The only powertrain currently available for the Ranger in the U.S. is a 2.3-liter four-cylinder gasoline engine mated to a 10-speed automatic transmission. As with other Ford diesels, the special emissions components would be integrated into the design of a production diesel Ranger. Adding another engine could give buyers more reason to consider Ford in a growing segment. The midsize pickup market surpassed 478,000 sales in 2018, a 16 percent increase compared with the year prior. Even as overall auto sales fall, the midsize pickup segment is growing at a 13 percent rate this year. General Motors offers a 2.8-liter turbodiesel engine in the Colorado and Canyon. The trucks have maximum towing capacity of 7,700 pounds and fuel economy up to 31 mpg on the highway when equipped with the diesel engine. Its output is 181 horsepower and 369 pound-feet of torque. Fiat Chrysler Automobiles will add a 3.0-liter turbodiesel engine to the Jeep Gladiator in 2020. Maximum towing capacity will be slightly less than the gas-powered Gladiator, which is rated at up to 7,650 pounds. It will offer 260 horsepower and 442 pound-feet of torque.